Tearless is a band formed in Ivanec Lepoglava in Croatia, they started around 2003 and since then they have been very active, releasing four demos, the first one is "Reverie" in 2005 which include four themes, then "World of shadows" in 2007 with two tracks, the third one is "The Path of Sorrows" released in 2009 with three songs and their last demo "Deathwish" came out in 2012 including three more themes, they play some kind of Dark Gothic metal... surprised? well it might be their logo, which fits more to a black metal band, but this is not the case. 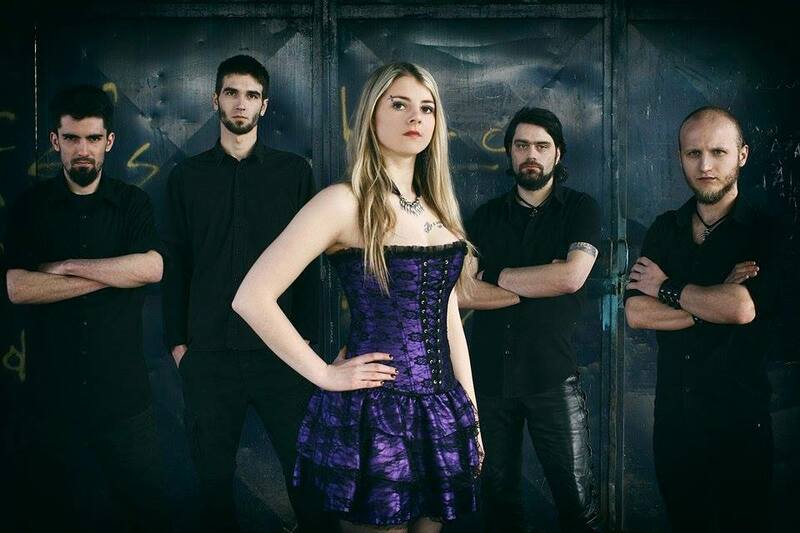 During their twelve years of career, they have been through a lots of line-up changes, their current members are founder guitarist and harsh vocals Zlatko Kušter, female vocals Ivana Novak, bassist and backing vocals Filip Babić, lead guitarist Siniša Godinić, drummer Miran Špičko and the keyboardist Rudolf Lovrenčić with this line-up they entered at Mathlab Recording Studio in Italy to produce, record, mixed and mastered their album debut by Jonathan Mazzeo which is titled "Step Into Darkness" it contains ten tracks which are basically a collection of their previous demos and tells the story of Tearless throughout their existence, the album was released in June 29th 2015 under WormHoleDeath Records. As soon you hear this album you can feel the adrenaline flowing suddenly in your senses and it is not difficult to identify the influences that inspired Tearless to create their music, bands such as Tristania, Moonspell, My Dying Bride, Paradise Lost and The Sins Of Thy Beloved just to name a few, are the ones that defined their path seems like they have picked up the sound of mid-1990s, but with a production more sleek and modern, twenty years have passed since many of us experienced those elements and few bands have been able to revive them and Tearless are one of those few bands. "Deathwish" opens this album with merciless drums and powerful guitar riff, growl vocals that mangle you ears and Ivana shines with her angelical voice, excellent guitar solo finishing the song at full intensity, "Room of Broken Mirrors" starts with a pretty piano melody that abruptly turns into a storm the clean vocals and harsh vocals blend emotionally, "Fallen We Are" sounds great not just for Ivana's vocals but Filip added an excellent bass line, "Step Into Darkness" the keyboard and guitars blends terrific to let Ivana's voice join while growl backing vocals interwoven with her, "Dreams of You" is the single to promote, again a stunning piano tune allows the guitar solo take over to fuse into a catchy melody clean male vocals are outstanding by Slatko and Ivana as always exceeds the expectatives, the drum section and bass are simply impressive, "Inside Your Raven Eyes" slower and heavy riff more oriented to doom metal, "Masquerade" opens with intense drumming by Miran to let Ivana take the spotlight, the guitars are versatile with good arregements, "As She Leaves Me Alone" loud, passionate very persuasiveness song, "World of Shadows" sets a dark ambience from the beginning, sadness spills from every note, Ivana's voice reflect an aching soul and the fierceness to play each instrument enrapture your soul, the closing track is "Heart of December" prevails in the dark gothic side of Tearless battling vocals between Ivana and Slatko, great guitar work through the song. I can finally conclude that "Step Into Darkness" is a great album, recommended to all lovers of the genre, may be a formula already known, but the intensity and conviction that they play make this album something worthy to enjoy, if you have the opportunity to listen to them please do not waste it.